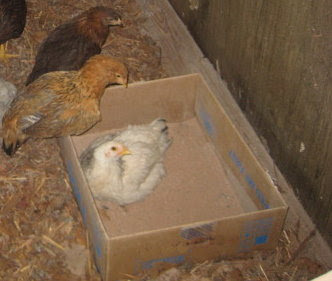 I noticed one of the chickens taking a dustbath in a patch of damp soil in their yard, and thought it might be a good idea to make them a dustbath box for the coop. 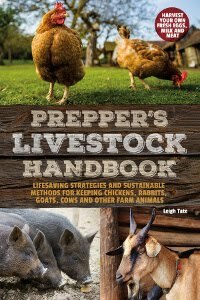 I did the requisite research online, and found that folks use various mixes of dirt, sand, dust, hardwood ash, and Diatomaceous earth. I decided to use what I had on hand, which was the sandy dirt that had been used to fill in the old swimming pool, and hardwood ash from the wood stove. It took a couple of days to dry the soil out, and in the mean time, I found an appropriately sized cardboard box and cleaned out the wood stove. 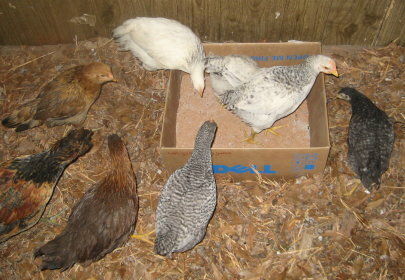 Once mixed, I placed it in the coop and waited to see what the chickens would do. As usual, Delawares were first to investigate. 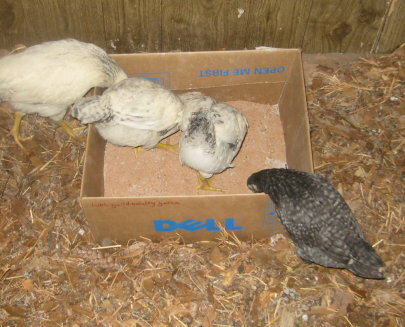 To my dismay, they were more interested in eating the sand out of the box than they were in bathing in it. Hmm. Wasn't all that grit I gave them good enough? I decided to wait and see if they figured it out later. ... i.e. outside the box. Oh well. I have to laugh, even not so intellectually endowed chickens have a mind of their own sometimes! They are looking quite mature. How old now? Picked out the roo's? looks like they're thinking outside the box. lol! I've ID'd 5 roosters and 3 hens for sure. The Welsummers color out differently as they mature, and of the 6, 3 are roos and 3 are pullets. Then I've seen the 2 white Ameraucanas crow, so there's 2 more. The Barred Hollands are supposed to be slow maturing, but of those 2, one is definitely developing a comb and wattles, while the other isn't. I'm hoping that means I've got one of each. Of the rest, I'm not sure. Renee, LOL. Too true, too true! Oh! I forgot. They're 8 weeks old. 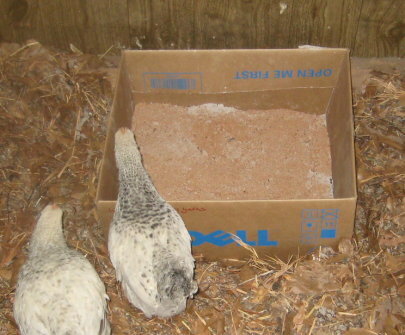 This is very funny :-) Perhaps the chickens wanted to dustbathe in something familiar and they have to get used to the sand in the box? The more you try to accomodate, the more they'll show you they can do it their way! They are looking pretty big now, when do you expect the first eggs? Evelyn, they're a hoot. We never knew how entertaining they are until we had some of our own. 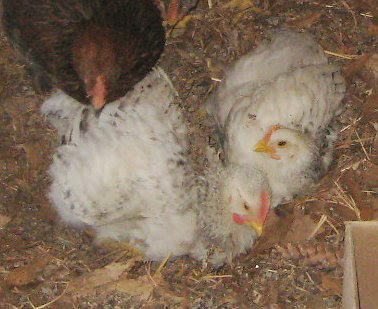 Lynn, their two months old now, so I'm guessing we'll have 1st eggs in July (?). I probably better get to work on those nest boxes because July will be here before we know it! What a show! Thanks for sharing with us as-yet-chickenless people. 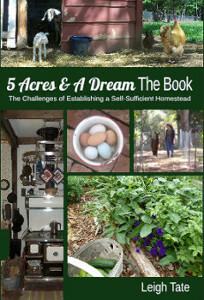 What a great gift for your chickens! We just let ours take theirs wherever but we have sandy soil anyway and there are plenty of shade spots for them to pick. Kaat, and thanks for sharing about bees with us beeless folk! Laura, I probably don't really need that thing! Mine get some dust bathing outside, but their yard soil isn't especially dusty. Sandy soil would be great in that regard. How funny. Chickens sure are a hoot.